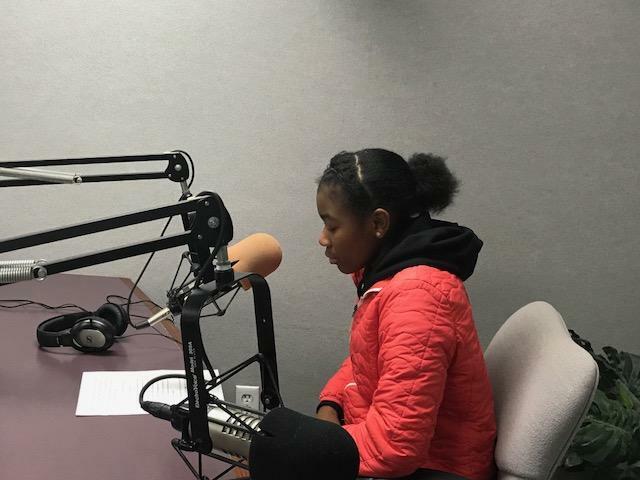 Makayla Johnson reads her story, "The Princess and the Butler" in the WBOI studios. Once upon a time, there lived a Nigerian princess named Lola Almani. She lived in a huge castle filled with servants, cooks and ancient art. Lola was turning 20 in one week and was searching for a husband. Her mother and father, the King and Queen, went all over Africa looking for the perfect prince to marry their daughter. The only country they have not been to is Ethiopia, so they finally traveled there and searched in every kingdom. They eventually found a prince named, Toby. They brought him back to Nigeria to meet Lola. When they arrived she came out the front doors to greet him. “Hello, how have you been on this fine, sunny day?” she asked. “I have been well, but even better when I saw you,” he replied. “Thank you for the compliment,” she happily stated. He was a real Romeo with the ladies. It was the day of Lola’s birthday party, and people from all over the world came to celebrate with her. All of her servants came to set up the ballroom. While Lola was doing her makeup in her room, a butler walked in to give her a gift. The Butler had been best friends with Lola since they were little kids. They played together because his mom worked at the castle for a million years. Lola always enjoyed his company, even as a teenager. She thought he was handsome, hovering, harmonic, healthy, happy and heavenly. He had a heart of a lion. As a child they thought they were going to get married when they became adults, but as Lola got older she knew her parents wouldn’t approve of a butler. “Princess I bought you a gift for your birthday,” the Butler told her. “You shouldn’t have. Thank you,” she chuckled back. Right after that Toby proposed to Lola. The entire party was excited for her, except her best friend. He was sad because he thought he was going to marry her. The rest of the night all of the guests and the princess danced and and laughed together. It was finally the wedding day. All of the guests arrived and took their seats. The Butler walked in by himself and sat down. All of the bridesmaids and groomsmen walked out. Eventually, the princess and king walked down the aisle. By the end of the night it was a wedding, but not with the Prince and Princess, but with the Butler and Princess. They looked so happy together. The Prince sat in a corner the entire night and cried up a storm, having a conversation with his rabbit but no one paid him any attention. The Prince was so heartbroken that he decided to sue the Almani family because he spent money on a wedding he wasn’t in. He didn’t win the case: His lawyer was as smart as fish bait. Lola and the Butler had three beautiful children and lived happily ever after. Turns out love conquers all.